Have you ever wondered what you should stock up on at the grocery store and when specifically? Packaged foods are seasonal – just like produce – and knowing what to buy when, can save you time, money, and hassle! 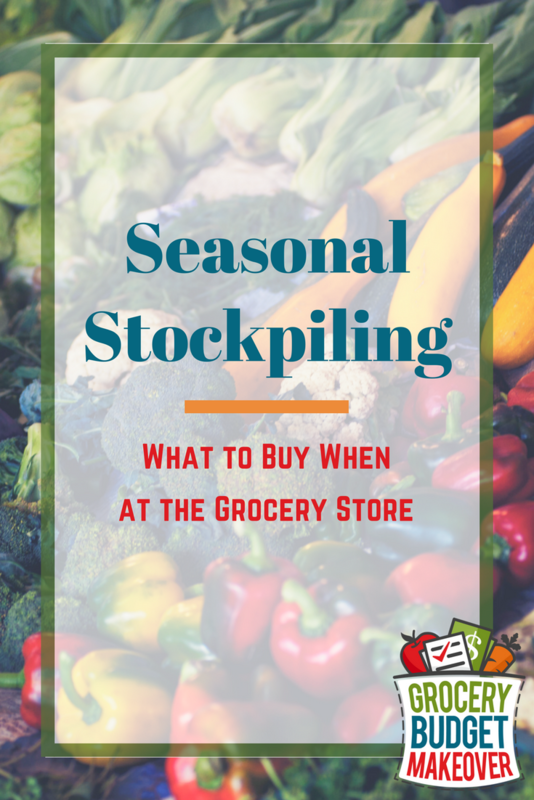 Here is a great list to get you started with seasonal stockpiling! Healthy foods such as whole grain cereals, 100 Calorie Packs, healthy soups and healthy conscious frozen entrees. It is also a great time to stock up on oatmeal (it is National Oatmeal Month!) and seasonal cold medicines. Don’t forget that the Super Bowl is right around the corner- tortilla chips, dips, appetizers, wings, and soft drinks are all foods to stock up on! February is the month of love – so make sure to stock up on chocolates and sweet treats for all of the loves in your life. It is also National Canned Food Month, so make sure to look out for sales on soups, canned meats, fruits, and vegetables and pie filling! March is Frozen Food Month! Frozen vegetables, sides, potatoes, and entrees are often on sale. Don’t forget about St. Patrick’s Day- corned beef, cabbage, and Irish soda bread are great to stock up on. And, of course, Easter sometimes falls in March- make sure that you have eggs, ham, candy and dye kits! If Easter is in April, this is the time for eggs, ham, candy, and dye kits. Baking supplies are also often on sale during April so stock up on cake mixes, frosting, refrigerated doughs, sugar, spices, and sprinkles! May is the start of the summer season, with Memorial Day ending the month. Stock up on grilling supplies such as foil, charcoal, paper plates, plastic utensils – and, of course, all of your favorite condiments. And please, please load your freezer with meat when it’s on sale! Don’t forget about Mother’s Day either! June is National Dairy Month – and the start of ice cream season! Stock up on your favorite flavors – or heavy cream to make your own. The end of the month begins 4th of July sales, so look out for hot dogs, hamburgers, potato chips and dips. July is generally a continuation of June as far as sales go (and it’s National Ice Cream Month!). Towards the end of the month, look out for back to school sales – and stock up on pencils, crayons, binders, paper and more. August brings the rest of the back to school sales – including things like tissues and disinfecting wipes. Don’t forget to stock up on school lunch items either- baggies, single serve items, lunch meat, and lunch boxes. And traditionally, cereals are also on sale in early August. September brings the last of the cookouts – so often condiments and hot dogs and hamburgers will be at a good price. It is also a good time to shop summer clearance for bug spray, fans, and BBQ supplies for next year! Halloween sales start early, so be sure to stock up on candy! Remember, this can be used for baking throughout the year. Towards the end of the month, Fall baking is in full swing. Make sure to check deals for canned pumpkin, spices, pie crust and dough, baking chips, and apples. Thanksgiving is the big trend of the month! Make sure that you have a turkey at least 2 weeks before the holiday. Stock up on your favorite vegetables and side dishes – including stuffing, green beans, cranberry sauce and pie. Most baking supplies will be on sale as well- stock up for all of your holiday baking for the rest of the year! Brownie and cake mixes, sugar, vanilla, and flour will all be needed throughout the baking season. Holiday dinners and baking are the best ingredients to stock up on this time of year. Rolls, ham, gravy, and any other traditional dinner supplies are great to look out for. Appetizers supplies such as crackers, cheese, dips, and mini sandwiches are great to have on hand. If you didn’t yet, grab all of the baking supplies you need for the new year! Do you practice seasonal stockpiling? What are your favorite ingredients to stock up during seasonal sales?? My first favorite time to stockpile is in November. I stock up on canned vegetables (about $0.50/can for name brand), canned cream soups (about $0.60/can) and turkey! Bargain premium Turkey breast especially makes nice roast turkey meals later in the year – and leftover turkey potpie and tetrazzini – months after we’ve recovered from turkey overload. My second favorite is summer: stocking up on canned name brand sodas at less than $0.25/can for vacation and lake trips. Also cereals for the school year ($1.00/box or less), schoolbox snacks and sports drinks for hot summer band camp ($0.50 for large Gatorade bottles).